Cat's Best Universal, a universal wonder: Cat's Best Universal is the low cost, ecological product from CAT'S BEST. It is made from 100% pure plant fibres from fir and spruce trees, creating pellets that have particularly high absorbency. Unpleasant odours and moisture are bound effectively within these fibre pellets, which are sterilised and spore-free, as well as being compostable and 100% biodegradable. This universal litter makes a great litter for a variety of pets and birds, such as cats, rabbits, hamsters, chinchillas, guinea pigs and many bird breeds. It works well as an additional litter for especially wet areas, for example areas surrounding water dispensers or dishes, or in small pet toilets. The independent product test commiΒion Stiftung Warentest certified that Cat's Best products are of the finest quality, with an excellent price performance ratio. 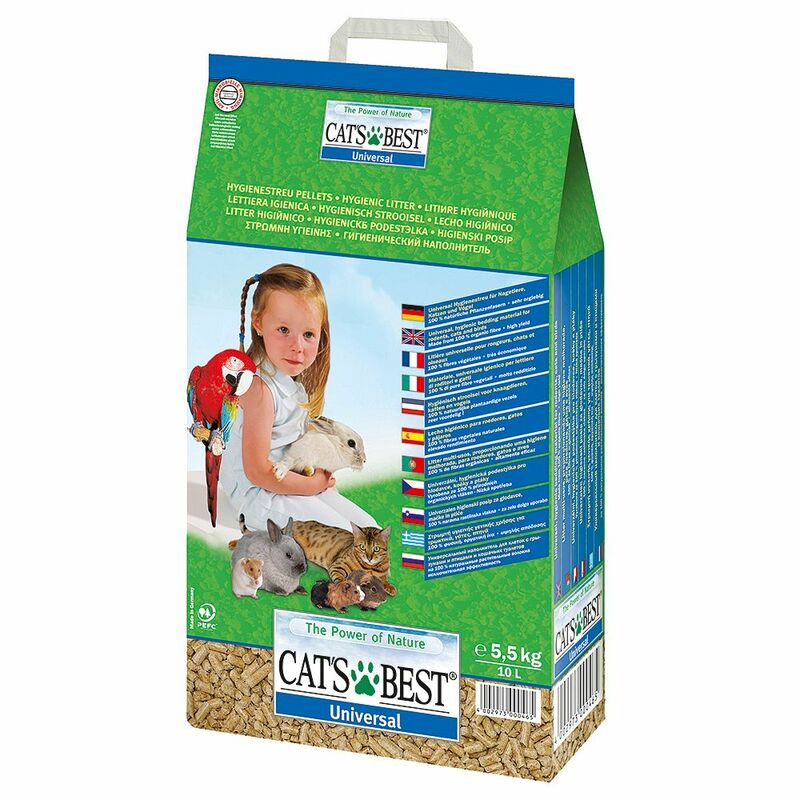 Cat's Best Universal cat litter is available in a handy 10 litre bag or in the economical 40 litre bulk pack. Cat's Best Universal cat litter at a glance: Litter pellets for small pets, such as cats, rabbits, hamsters, chinchillas, ferrets, guinea-pigs and birds Ideal on its own, mixed with another litter or or as an additional litter Ecological: 100% pure plant fibres High absorbency Traps and retains moisture effectively Binds odours naturally Compostable and 100% biodegradable Easier to transport Much leΒ waste to throw away Pleasant, natural smell – no artificial additives.